Every cook has one. It’s like the dress you bought because a friend said you should and it was a great buy and you really could picture yourself wearing it – just not where, or when. It’s the cookbook you bought because the reviews were so great, or you met the author, or someone gave it to you as a gift. You may have even looked through it several times and tabbed the pages of recipes you wanted to try, but somehow never did. Well, Alyssa of Everyday Maven and Faith of An Edible Mosaic had a brilliant idea. What if food bloggers traded those books with each other? For only the cost of postage, we’d get rid of something too good to donate and get a gift in the mail! Besides getting a great cookbook, we’d all make new blogging connections, too. I was surprised and excited when I received Anthony Bourdain’s Les Halles Cookbook in the mail from my friend, Michelle of Je Mange la Ville! 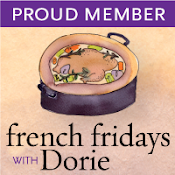 Michelle and I participate in French Fridays with Dorie which is an online group dedicated to cooking our way through every recipe in Dorie Greenspan’s Around My French Table. The cool part, is that Michelle & I met each other – and Dorie – in September at the International Food Bloggers Conference in Seattle. Since Michelle knows me, she knows I’m interested in French cuisine. Although I’ve heard a lot about Anthony Bourdain, I didn’t have any of his cookbooks – until now. 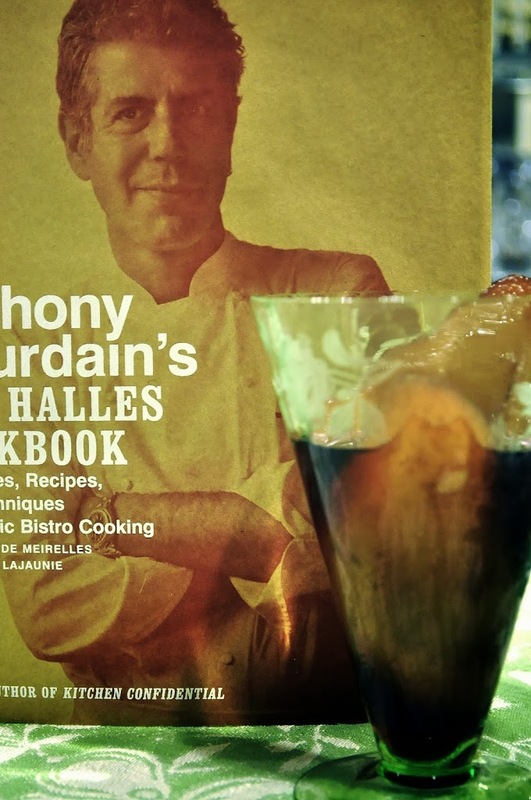 I tabbed several recipes to try but happened to have four Bosc Pears sitting in my fruit bowl when this book arrived so we decided to try Bourdain’s Pears Poached in Red Wine. John makes poached pears regularly when they’re in season but we always use a sweet white wine like Moscato or Riesling. Since Bourdain’s recipe calls for red wine, we used a sweet German wine. His method is a little different than ours, too, but yielded a even more delicious result. 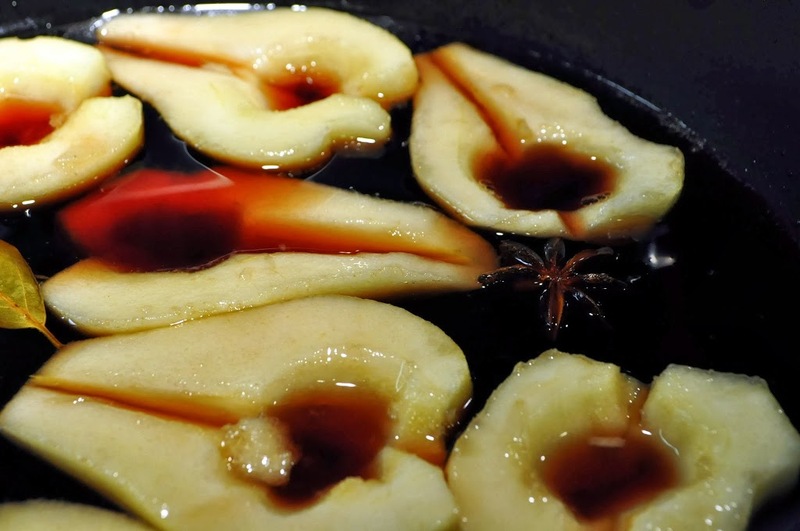 These Pears Poached in Red Wine are divine – and the wine sauce was delicious enough to drink on it’s own! Amazing. Take a few minutes to check out the other participants in the Food Blogger Cookbook Swap! You may make a few new friends. Thank you, Michelle! And thank you Alyssa & Faith! Hi Susan! Oh, the pears look great! So glad you are putting the cookbook to good use 🙂 Enjoy! Those look fantastic! This was such a FUN blogger event. My husband is obsesssssssssed with Anthony Bourdain and I can’t believe I don’t own any of his cookbooks! I used to live near Les Halles so I think this might be one to check out! 🙂 Nice to meet you via the swap! 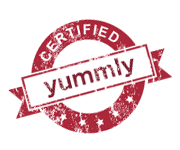 I love French cuisine as well – will definitely be following you! I have really enjoyed watching Anthony Bourdain on The Taste and think I’d like his books too. The pears look wonderful! Such wonderful looking pears! I am just starting to get into French cuisine. Love it so far! Thank you so much for participating in the swap and helping to make it a success! 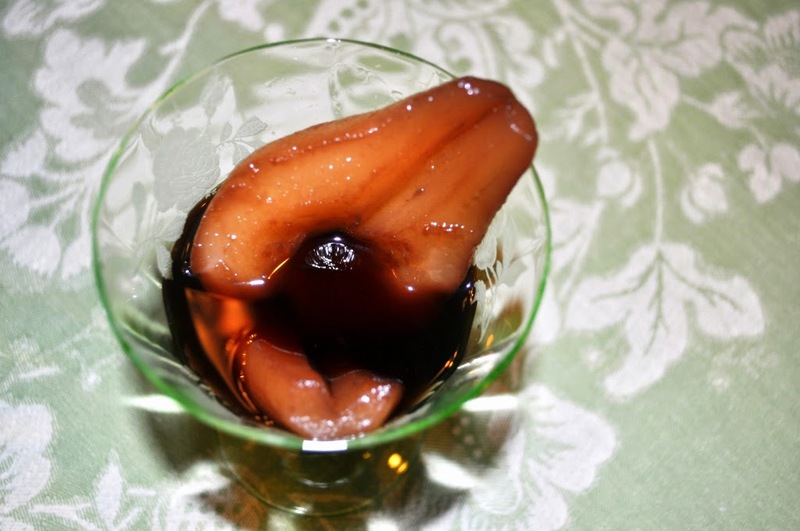 The recipe you made looks lovely – poached pears are a favorite of mine! I had another Dorista sista’ pairing! I sent Christy a copy of the Puerto Rican equivalent to Mastering the Art of French Cooking. I have read some of Bourdain’s memoirs, but like you haven’t seen his cookbooks. Bistro classics are always fun! The pears look delicious. This was fun, wasn’t it? Red wine…bay leaf…star anise….I can almost taste them! They look lovely, and I bet this is a fantastic addition to your collection. How fun to also be paired with another Dorista! Adriana sent me a fantastic book on Puerto Rican cooking that I can’t wait to dig into. I’ve read Bourdain’s books, but haven’t seen his cookbooks – these pears look great, and I’m interested in hearing how you think his recipes compare to Dorie. How fun that Michelle got paired with you – very cool! Thank you for participating and helping to make the swap fun! Those pears look delectable! Nicely done for the swap!